Fast Passes are ways of bypassing the main lines in rides. Here’s how it works. You take your family’s park passes and go to the ride. There are machines marked “Fast Passes.” Put the park passes into the slot and the machine will shoot them out along with a fast pass for each park pass. There is a time period printed on the fast passes. When that time comes, go back to the ride and get in the “Fast Pass Return” line. You’ll find that this line is much shorter and allows you to get on the ride much faster. You don’t need all your family members with you when you get the fast passes, but they do need to be somewhere in the park. All in all, Fast Passes are a great way to save time. 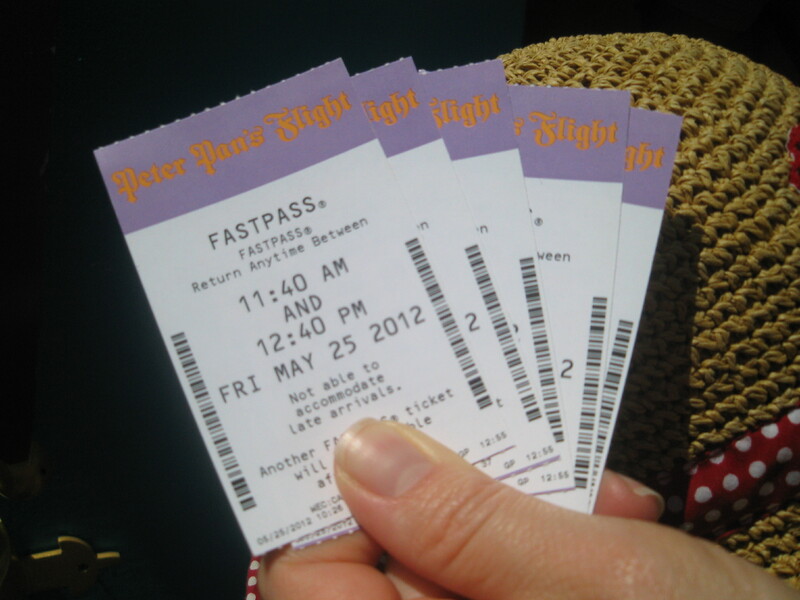 These Fast Passes are for “Peter Pan’s Flight” in the Magic Kingdom.